So you all know Murphy’s Law right? What can go wrong, WILL go wrong? Welcome to my day today. It was day 2 of my new job as a long term care dietitian. I wanted to go into work at 8am or 9am, so I set my alarm for 6am. I’m trying to get a consistent sleep schedule… bed by 10:30-11pm, up by 6am, work by 8am no matter what job I’m at. Well for some reason I never heard my alarm go off. Really weird… and really frustrating, because when I finally jerked myself awake, it was 7:30am! 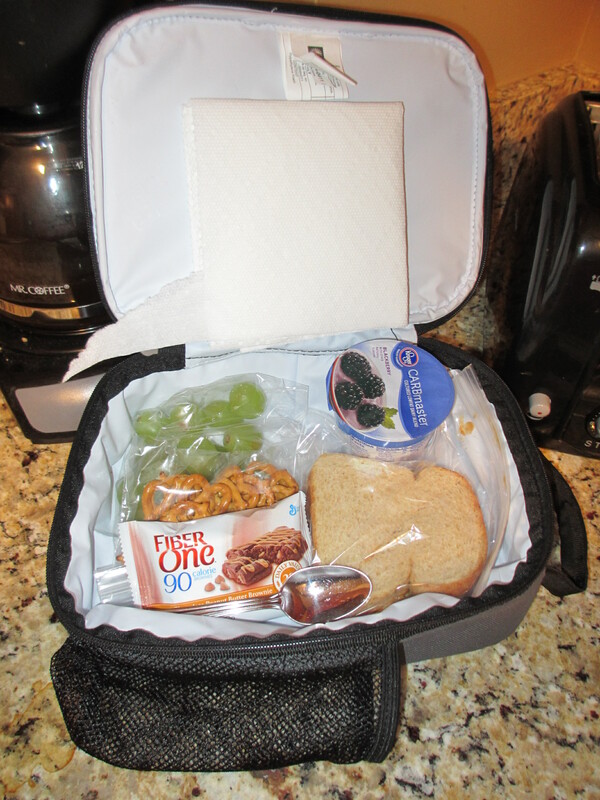 Juicy grapes, crunchy pretzels, a PB&J sandwich, blackberry yogurt, and a Fiber One brownie for dessert! Since I was rushing around to get ready, I really didn’t have much time for breakfast. So I once again had a Carnation Instant Breakfast. Honestly, I love that stuff! It’s so nice when you’re in a rush to just whip up an 8 ounce delicious, creamy glass of that stuff. Bella hung out with me while I put together my lunch and made my glass of CIB. She’s learned how to eat and drink with her “Cone of Shame” on. Makes life easier on us! An update on Bella: We took her back to the vet on Monday because she had once again ripped out her stitches. 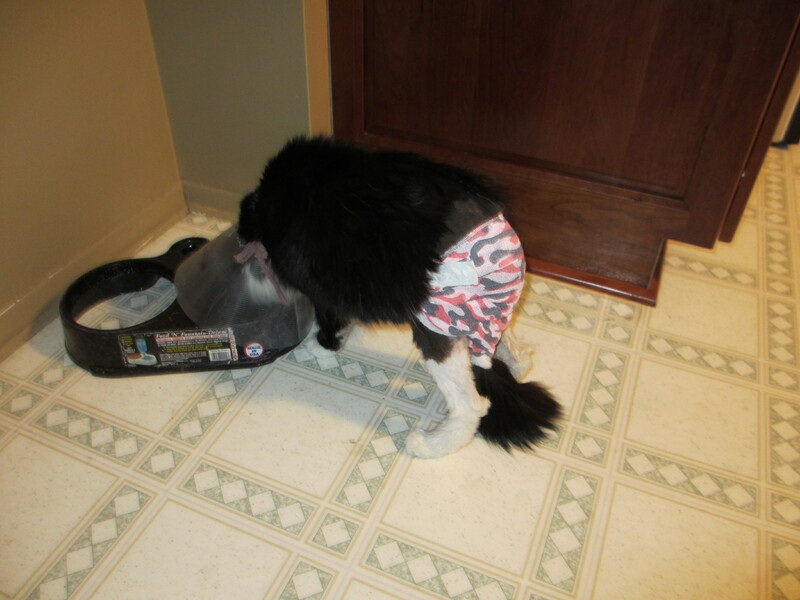 We picked her up Tuesday night and the new approach is to keep the wound open, but covered, hence the cute little pink camo pants she’s rockin’ in that picture! We have to visit the vet DAILY to have them change the dressing, and I don’t even want to mention the pricetag that all of this care has racked up. Worth every penny though – Bella is like our child! Today was pretty hectic. I thought I had my “stuff” together, but I absolutely didn’t. One day’s training definitely was not enough for me. I’ve got a list of questions and helpful pointers that I started today… hopefully I will be more organized and under control when I go back there on Monday! Since I was all over the place, I ate my lunch very quickly again today, and left a lot of the snacks for later. 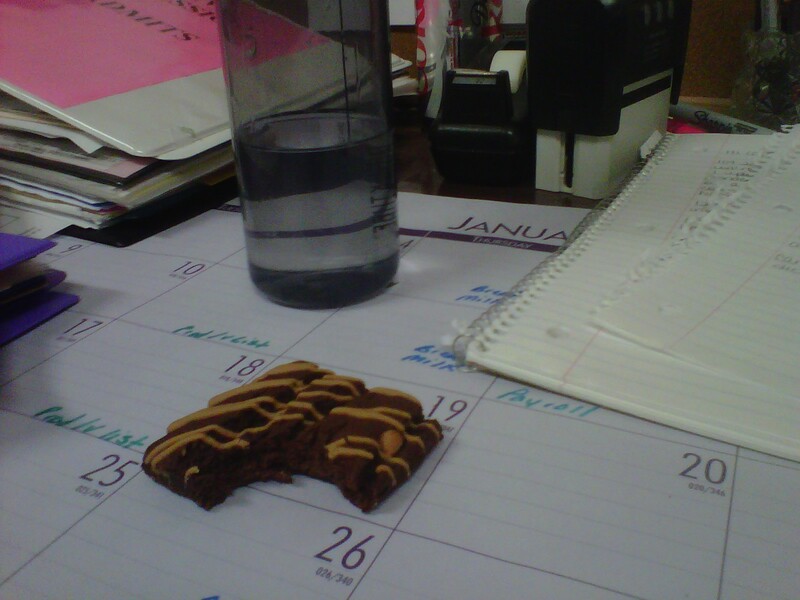 I finally got to enjoy my brownie near the end of my day when I was updating meal tickets in the computer. Delish! Only 90 calories with 5 grams of fiber. On my way home I picked up a pound of beef so that I could make something at home. 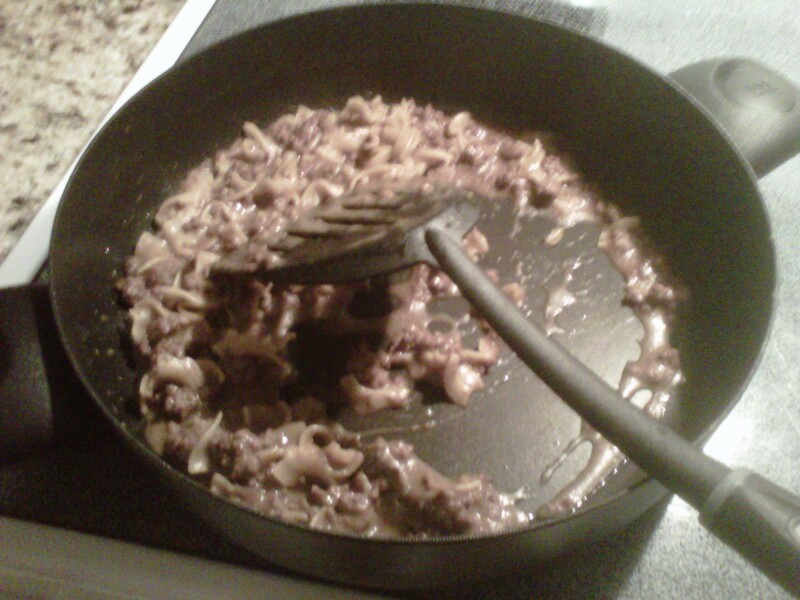 I asked Ken to brown the beef for me, and he ended up making the whole meal (awww!). It was a nice break to not have to cook for us and I felt pretty spoiled. It was yummy – definitely hit the spot! Overall, it was a good day. I wish that I had more time to eat like I do at home at my new job… but it seems as if it’s back to the way I ate when I was in my dietetic internship: grab a quick lunch and snack whenever you can in between! And make sure you have a good breakfast <– gotta work on that one! ooooh noooooo! another pup in the cone of shame eh? poor bella!